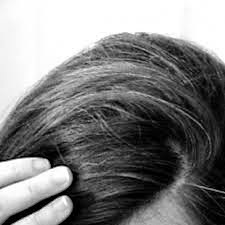 If you are finding Sliver or Gray Hair after 40-45, it is not a disease this is natural. With the passing of time your hair loses its color and turned into gray. But it doesn't effect on your hair growth and health. If your hair did not have any problem then they can live with you at the end. Because Males take not good care for their hair like Females. So they face baldness or hair dandruff and fast gray hair after 40 or in old age, more than women. Different hair color develops in their Follicles. Hair color made with a brownish material which called Melanin. Quantity of Melanin is different in different people. If the quantity is more than your hair color will be black and if it is less your hair color turned into Gray color. If the quantity of Melanin is a little bit lower from average level your hair color will be brownish or golden. Hair color develops in the cells of Follicles. The hair color of our body hair is also based on this which gives a different color to our body skin. Sun light (Vitamin D) improves Melanin development but sun rays effects on hair color. We cannot change the ratio of Melanin in hair but we improve it from the roots or skull skin. Tension and stress are the Main Big cause of Gray Hair. With Tension and Stress Follicles slow down the growth of black color or stop it totally. Use the Foods to reduce the Stress. The other main cause is inheritance. Some people to this cause get more quickly gray hair than others. Some Medication stops the growth of Follicles and your hair changed. Boil 100 grams Crush Dried Goose Berry (Amla) in 250 grams Coconut Oil on low flame. When the gooseberry starts smoking than turn off the stove. Leave the oil to clod than filter the oil and keep it in a glass bottle. This oil would be enough for 2-3 months. Use it regularly daily for 3 months your gray hair will improve its color and new growing hair will be black in color. Boil Black Tea in water and after washing your hair rinse your hair with this tea water. Leave your hair for 25-30 minutes and shampoo your hair. This remedy is also effective for gray hair. Mix 1-2 tablespoon Almond Oil in 1or 2 Egg Yolk and 1 tablespoon Sikakai Powder in it (increase the quantity due to the length of hair), apply this mixture with hair brush and leave it for 40-45 minutes. After washing your hair pat dry with towel and apply a little amount of Almond Oil for a little massage. Use this remedy for 2-3 months thrice a week for effective results. Make a paste with Yogurt, Fenugreek Seeds Powder and Egg Yolk. Apply this paste on hair root with your fingertips. Leave it for 2-3 hours then rinse with normal water. After steaming your head massage with Olive Oil daily with your finger tips. Olive is very much healthy for the health of hair and skull skin. Or Mix an Egg Yolk in Olive oil and apply it on your hair. After continuing use of this mixture into your hair will turn your hair into black. Mix Aloe Vera Gel 4-5 tablespoons, 2 egg yolks and 1 tablespoon Goose Berry Powder. Apply this mixture for 1-2 hours thrice a week. 1)Some exercises like Moving Head in round circular motion or moving left and right are very much helpful for hair health and growth. 2)Keep your hair from dust and keep clean. Wash your hair with normal or cold water in place of warm water. Warm or hot water will remove Melanin of your hair. 3)Keep your hair form dandruff it blocks the follicle cells' growth. Massage your skull and hair with massage oils regularly.